Clayfolk members number over 140 and we welcome new members who want to share ideas and experiences about ceramics. We encourage those interested in joining to attend one of our members meetings where you can ask questions and get to know other potters. The membership year runs from January to December and is not pro-rated, meaning you may join at any time. To receive your 3 annual membership points your dues need to be paid by the end of December each year. See below for a New Member Packet and to learn about the Clayfolk points system. Please take a moment to download your New Member packet with all of the information needed to help you begin your participation in Clayfolk. We look forward to sharing the joy of ceramics with you! Clayfolk uses a points system as a way to acknowledge and reward members who have put so much of their time and effort into the organization’s success. In turn, accumulated points provide a fair way to allocate limited booth space at the annual Clayfolk show and sale. Learn more about Clayfolk’s points system. The Clayfolk Show and Sale is a cooperative endeavor created to sell our clay work, educate the public, and have fun working together. The show is a true group event in which all participants work on committees, are assigned work shifts during the show, and have scheduled mandatory meetings. 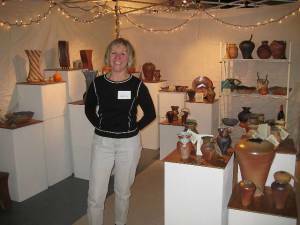 Any member belonging to Clayfolk may apply to be in the show’s Gallery and/or Group Booth, and any member belonging for 12 months or more is eligible to apply for individual half or full booth space. Assignment to any size booth is allocated by member points which are earned in a number of ways including for each year of membership, holding offices, chairing committees, and attending general meetings. Learn more about the Clayfolk Point system. The show application is distributed in the late spring to all members.